ABOARD THE SUBMERSIBLE ANTIPODES (AP) — The invasive lionfish that crowds coral reefs and preys on native fish in the Atlantic's shallower waters is such a problem that divers in Florida and the Caribbean are encouraged to capture and eat them whenever they can. Lionfish, which have venomous spines, are a well-documented problem in Atlantic coral reefs, where the foot-long, one-pound invaders from the tropical parts of the Pacific and Indian oceans live without predators and eat other fish voraciously. What's slowly coming into view is how deep into the ocean their invasion has spread. Researchers and wildlife officials worry that lionfish may undo conservation efforts aimed at rebuilding populations of native predators such as groupers and snappers. Lionfish gorge on the young of those species, as well as their prey. "They can eat pretty much anything that fits inside their mouths," Oregon State University lionfish expert Stephanie Green said. Divers are encouraged to capture and eat any lionfish they encounter to protect reefs and native marine life already burdened by pollution, over-fishing and the effects of climate change. And last month, the Florida Fish and Wildlife Conservation Commission waived the recreational license requirement for divers harvesting lionfish and excluded them from bag limits, allowing people to catch as many as they can. But recreational divers max out around 130 feet deep, though. Researchers and wildlife officials rarely have the means to venture deeper than that, but they've realized the lionfish they can't see may be their biggest concern. As Green discovered on a recent expedition aboard a submersible, there's little to disturb a lionfish living on a wreck 250 feet deep into the Atlantic. There are no predators and no divers. "I did not expect it to be this loaded with lionfish," Green said. 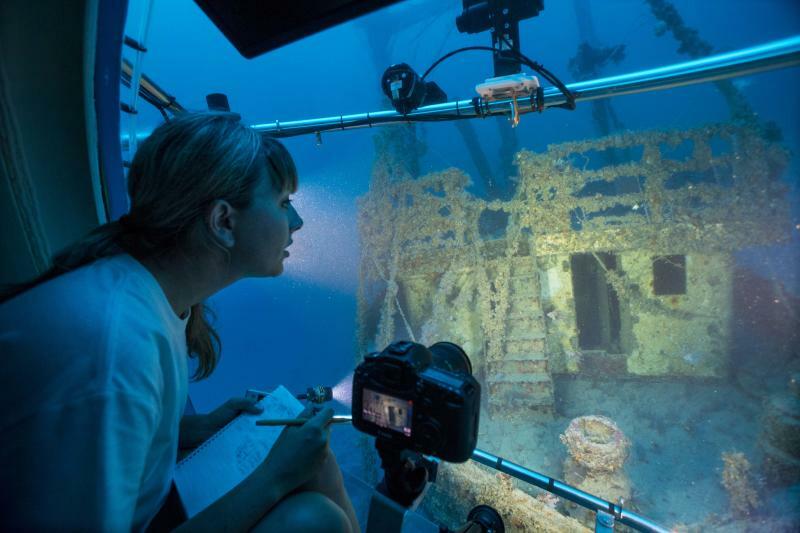 In less than half an hour, she tallied nearly three dozen lionfish in view across the stern of a steel freighter sunk in the 1980s as an artificial reef a few miles off South Florida. She could have continued counting, if the yellow submersible's draining battery had not required a trip back to the ocean's surface. Last month, Seattle-based OceanGate Inc. offered scientists and wildlife officials a close-up look at deep-water lionfish in dives aboard the yellow submersible named Antipodes. In strong currents that might have tangled a tether connecting a remotely operated robot to a vessel at the surface, the Antipodes sank and rose as smoothly as an elevator. Maneuvered by a joystick, it crawled over the sand at a walking pace. Green and other researchers who took the dives surfaced believing they had seen the frontier in their fight against lionfish. The next problem will be routinely making similar dives to study and perhaps capture lionfish. They would seem to have a lot of water to cover — the deepest confirmed sighting of a lionfish was at 1,000 feet in the Bahamas. "We are capable of doing a good job of controlling lionfish at diveable depths, in shallower areas. Divers and spearfishers can go in and remove the fish. But the lionfish are abundant in large numbers at these deeper habitats, and that's really where the next frontier of this battle is going to be, in those deep water areas," Green said. Lionfish in the Atlantic Ocean have similarities to the Burmese python, the large, ravenous snake that researchers say is decimating native mammal populations in Florida's Everglades. Both are fast-breeding invasive species likely introduced through the pet trade, with no natural predators to keep their numbers in check. Desperate for some kind of control over their populations, Florida this year enlisted volunteers and amateurs to go after both. But when it comes to lionfish, Dan Ellinor of the Florida Fish and Wildlife Conservation Commission noted that those efforts primarily target areas already frequented by scuba divers. "We're going to have to figure out how we're going to get below the diver depths," said Ellinor, a biological administrator with the commission's marine fisheries division. "The other problem is there's not a commercial market per se," he added. "It's very small, very minute, it's in the Keys, it's beyond the reef in about 200 feet of water and it's bycatch out of traps, lobster traps." More and bigger lionfish now live throughout the Gulf of Mexico and in the Atlantic between the Carolinas and Colombia than in the species' native range in the Indian and Pacific oceans, researchers say. Worse, it's not known what controls lionfish in their home waters — maybe a parasite, or something eating their eggs and larvae before they develop their poisonous spines. In Atlantic waters, lionfish apparently have nothing to fear except cold water and scuba divers equipped with specific gear. "They pretty much have been unprecedented in any marine invasion. It's the largest, the quickest, the most extensive marine invasion we've ever seen," said Nova Southeastern University's Matthew Johnston, whose work predicting the spread of other invasive species is based on the success of the lionfish. Officials have concluded that if you can't beat lionfish, you can at least eat them, even though commercial supplies and the market for the lionfish remain very small. For years in the Caribbean, dive shop operators, conservationists and some restaurant chefs have been trying to slow their spread by turning them into menu items. Derby-style lionfish tournaments are held from Bermuda as far south as Curacao, a Dutch Caribbean island off the coast of Venezuela. In the Turks and Caicos Islands, the government once put up a cash prize for the first fisherman to catch 3,000. In Bonaire, where the economy is dependent on reef diving tourism, volunteers are being licensed as "lionfish hunters." Supermercado Nacional, the largest chain of supermarkets in the Dominican Republic, occasionally has lionfish for sale depending on availability. The National Oceanic and Atmospheric Administration launched a campaign in 2010 urging the U.S. public to "eat sustainable, eat lionfish!" Associated Press writers Ben Fox in Miami and David McFadden in Kingston, Jamaica, contributed to this report.